Belfast is a city unlike any other; with an infectious energy and an extensive range of pastimes to please any visitor. This in turn makes the city un-missable and a popular location to return to again, and again. Belfast is arguably best known for its rich, and colourful history. Most notably the city was the birthplace of the luxury, yet tragically doomed Titanic. For those viewers that like us, have a budding interest in the story of Titanic you will be thrilled to know that Belfast is home to the world’s largest visitor experience centre. However, despite some of the better known tourist’s attractions the city is also home to some of the very best hotels around; in which the Europa leads by example. The Belfast Europa is a member of the prestigious Hastings Hotel chain; which in our experience follows the principles of exceptional, intimate service from all staff members you en counter combined with faultless luxury within the hotel, which subsequently results in a truly unique home from home feel. The Europa Hotel is a well known and majestic building, superbly located for quick and hassle free access to many of Belfast’s key points of interest. The Europa offers guests the choice of 272 newly refurbished bedrooms, which includes both executive bedrooms and themed suites. In accordance with the city’s history, the Europa has designed a luxury Titanic Suite which has been in operation for three years now. The suite is stunning; lavishly decorated with rich, complementing colours filled with all the modern comforts you could so desire whilst including books and plaques on the luxury liner itself. When considering the above information it is of no surprise that The Europa is a popular choice of location with guests and celebrities alike. Notable names include the former US President Bill Clinton and his wife Hillary Clinton, the Mummy star Brendan Fraser and musician Van Morrison to name but a few! 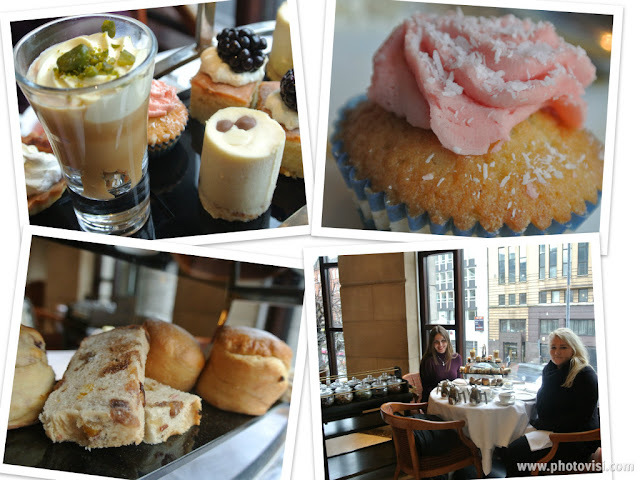 On a recent trip to Belfast, we could not resist trying our very first afternoon tea in Northern Ireland at the Europa. Afternoon tea here is a subject taken very seriously, with results that will leave you both deliciously satisfied and eagerly planning when you can next visit to experience every delicious bite again. At the Europa afternoon tea is served in the Piano Lounge, which we both agree is simply stunning. The Piano Lounge is beautifully decorated, with large windows allowing natural daylight to pour into the room whilst offering guests views of the bustling Great Victoria Street below. This is combined with a relaxed and refined atmosphere, where the seating is arranged to yield every guest with just the right level of intimacy to ensure your afternoon tea is enjoyed to the maximum. A touch we really like, and what we believe makes the Europa afternoon tea stand out from other venues is a lady called Helen Mc Cune. Helen is an afternoon tea specialist, and it was Helen that designed the afternoon tea menu. From the moment you are shown and seated at your table, Helen will guide you through your experience. Regardless of whether you are new to the afternoon tea world, or self diagnosed addicts like us Helen’s dedication to ensuring you have the very best experience, results in just that. Once settled at our table, Helen came over to introduce herself. 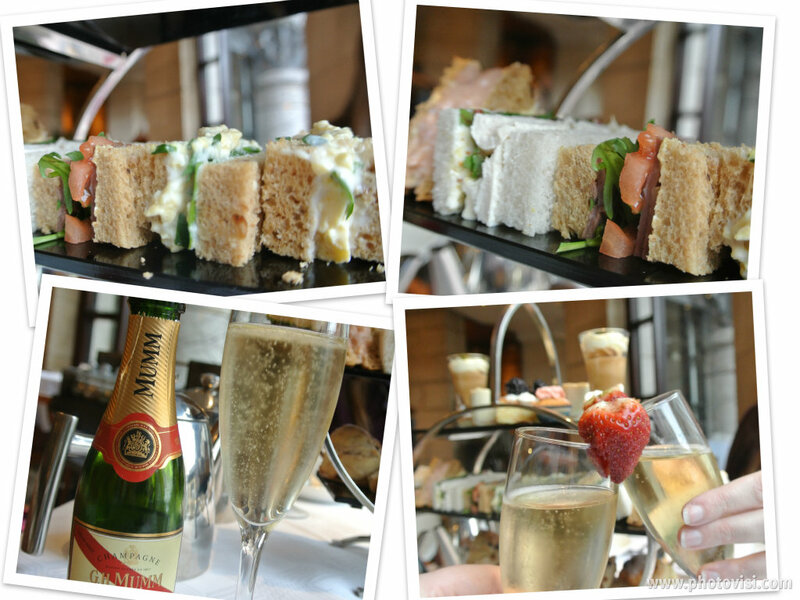 We were talked through the different afternoon tea options with MUMM champagne or not before our experience began. In no time at all Helen returned to our table wheeling, a large wooden tea trolley filled with beautiful, deep, glass jars of loose leaf teas. The tea selection has been hand selected by Helen herself; sourced from a local family specialist tea company: Thompson Tea. We where individually introduced to each tea, which consisted of helpful insights and direction into which tea might be best suited for the different tiers of the afternoon tea itself. The tea selection experience was very enjoyable whilst encouraging hands on interaction. Our favourite part of the experience was when the jars where opened to release the stunning aroma concealed inside! 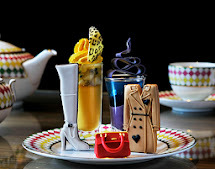 It must also be noted that the Europa unlike some venues we have visited allows you to change teas throughout your afternoon tea; in fact it is encouraged that you try each one. The tea selections are impressive; ranging from the ‘Hasting’s Blend’ which is a traditional strong tasting tea to the classic ‘Earl Grey’ fashioned with rose petals to give it that additional feminine twist (which we must state does not have any effect on the taste!) to one of the Europa’s most sought after teas ‘Lemon and Ginger’ with a sensational aroma. After much deliberation, We began our afternoon tea with the classic Hasting Blend and Earl Grey. As we sat sipping our tea, taking in the beautiful aroma Helen returned with a beaming smile. It was immediately evident just why she was smiling so widely; she was holding our afternoon tea. The afternoon tea was served on a modern, three tier stand allowing us to truly appreciate just what was in store for us on this Sunday afternoon. Our afternoon tea was placed in the centre of the table; and at this stage we must admit our mouths already began to water in anticipation! Helen talked us through the three tiers of the stand; the bottom tier was an assortment of scones and raisin/cinnamon infused bread chit-chat. Our favourite item on this tier was undeniably the scrumptious scones. The scones served at the Europa breakaway from the traditional scones served at other venues; whilst still perfectly capturing the very essence of the ideal scone. The scone served at the Europa is a deliciously decadent combination of white chocolate and blueberry; keeping in consideration that the scones are served warm (having been freshly baked) the white chocolate melts within the middle. The middle tier contained the following extravagant freshly cut sandwiches served on Irwin’s bread: Crossgar chicken with red onion and parmesan in a lemon Mayonnaise, Mortedella and basil pesto with sundried tomato, Kilkeel prawn and lobster, free range egg, spring onion and rocket and Roast Beef with plum tomato and red onion finished with Dijon Mustard . Some of our favourite sandwiches where the Kilkeel pawn and lobster and Crossgar chicken with red onion and parmesan in a lemon Mayonnaise sandwich. It is worth stating though; that each sandwich excelled in its own right in terms of taste. The top tier contained the following desserts: Banoffee Trifle, Chocolate and Bailey’s Cheesecake with a sponge base, Lemon Meringue, Peach and Almond Sponge and Vanilla Cupcakes with strawberry icing. This tier was our favourite; and who could blame us for falling in love with each dessert? The desserts were faultless exploding with flavour resulting in us being unable to determine a favourite. Afternoon Tea is served daily from 2 – 5pm. Enjoy live musical entertainment every Saturday. £18 per person its fantastic value for money! Add a touch of sparkle with a glass of our finest MUMM Champagne for only £8 per glass.